A thermal scope is an essential piece of hardware in every nighttime hunter’s arsenal. 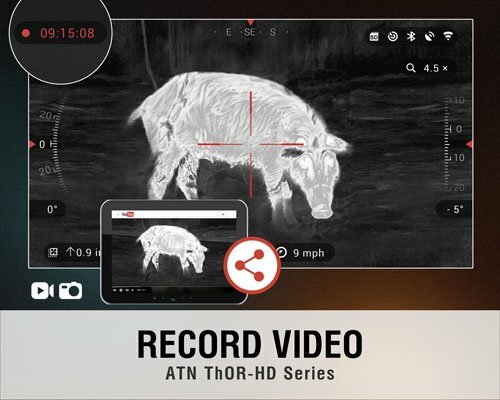 The ATN ThOR HD 384 is a great choice for an inexpensive (depending upon optics chosen) feature packed thermal imaging scope. You may have come across the ATN Corp brand before. The company is a leading developer and manufacturer of precision night vision optics and thermal scopes. The ThOR HD Line consists of some of their technologically advanced thermal scopes on the market. These devices all use the Obsidian II Thermal Core processor. They are full-featured offering more power in a small package at a reasonable price. ATN has also just released their newest line the ThOR 4 which we cover the differences of here. 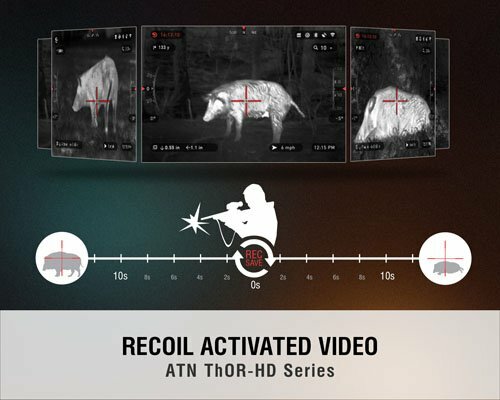 The ATN 384 features a 384x288 thermal sensor and a 30Hz refresh rate that helps minimize blurring when tracking moving targets. Thermal imaging works on the principle that all objects emit infrared energy as heat. It uses a unique lens which focuses the energy on an array of detectors/sensors otherwise known as a microbolometer. It takes the sensors milliseconds to detect the temperature information and create a thermogram using this data. The thermogram is then translated into electric impulses which are then sent to a signal processing unit. A dedicated chip on the circuit board translates the signals and feeds them to the display. At this point, you can tell what’s on the display whether it’s a tree, a car, a person, or an animal. The ATN Obsidian II Core powers all Smart HD Optics by ATN and this Includes the Thor-HD 384. The ATN 384 uses an industry-leading digital image processing architecture, a range of environmental sensors, and an array of image sensors to create accurate thermograms. The high-performance ARM processor is designed to quickly interpret data and deliver the thermogram to the screen instantaneously. It can drive a variety of CMOS (complementary metal-oxide-semiconductor) and microbolometer sensors at 1920 x 960 resolution at 30 fps. Note however that is not the thermal sensor resolution but the visual display resolution. It also includes a user-friendly interface which is easy to set up. It offers many customization options; with only a few clicks you can change the focus of this scope helping you get a clear shot in a variety of situations. If you have ever gotten confused when dealing with sophisticated reticles, charts, and calculators to try and make sure your shot is on target then the 384 is a great option. With the ATN Thor-HD 384, you’ll be dealing with a system that helps you hunt responsibly by helping to ensure your shot hits the target every time. This scope helps interpret environmental data using its ballistic calculator. You will get critical data like wind speed, wind direction, relative humidity, altitude, as well as many other pieces of data that are necessary to give you the highest chance of hitting your target. You can also adjust the incline angle, which will change the point of impact easily. This increases your chances of hitting the target on your first shot. A built-in rangefinder simplifies your hunting experience even more. You can skip bringing another range finder since it gives you the correct estimate of a target's location quickly and easily. The system will automatically adjust the point of impact once the range is calculated. You can save the zeroing and ballistic data in the scopes profile manager. This means you can use the same data on every rifle you use this scope on. Typically, each time you need to record a video, you will need to hit the record button; but this is not really something you have time to do when getting ready to take your shot. The Obsidian Core lets you focus your attention elsewhere as it will record videos using the Recoil Activated Video Function. When your scope is in this mode, the system buffers the video input from the scope for a set number of seconds and on pulling the trigger, the scope records everything from before the shot, taking the shot, and seconds after the shot allowing you to capture everything for replay’s to not only celebrate great shots but also learn and adjust when shots are missed. The ATN Thor-HD 384 can also record still images with a high resolution of 1280 x 960. It features gyroscopic image stabilization that keeps images steady even at high power. The 384 also prevents blurring of images on the edges as well as improving the ability to spot game. The ATN 384 captures videos in stunning HD. It can record videos at 30fps and save those videos on an onboard micro SD card. You can then retrieve these videos through a micro HDMI output which lets you connect to a computer or TV allowing you to playback all your shots from your hunting trip. The scope supports SD memory cards from 4GB up to 64GB. It also includes a built-in microphone which captures sound; although you can turn the microphone off if needed. You can download the ATN Obsidian app and connect the scope to your smartphone or tablet. It allows you to control the scope and stream live images on your phone or tablet. It also has a gallery which keeps your recorded videos and images. The scope connects either via Wifi or Bluetooth ensuring you are always able to connect your phone or tablet. Typically when you zoom in on a target, your field of view narrows which means you do not see as much of the target area as before. The ATN Thor-HD 384 however gives you a silky smooth zoom so that you can magnify objects and have minimal field of view loss or image distortion. The 384 is designed to provide a smooth interaction between the user and the functions of the scope. The tactile buttons allow you to feel every click as you zero in. You also have a spin-to-zoom wheel which smooth and natural. Not to mention, the large buttons that are easily operated even with gloved hands. 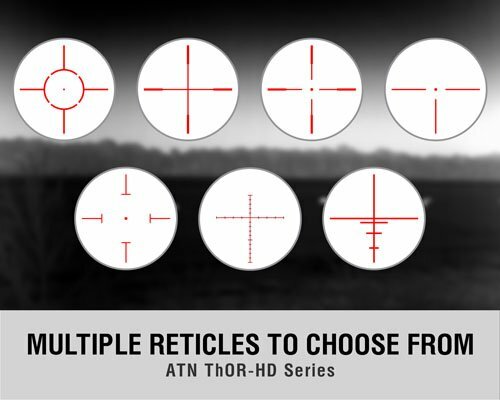 The ATN Thor-HD 384 allows you to adjust the reticle after taking the first shot which helps ensure you will do not have to take several shots to zero in your scope. The new Obsidian Core processor runs fast and cool. It gives you up to 8 hours of continuous battery power. You can also bring along the ATN Extended Life 2000mAh Battery Pack. It gives up to 22 hours battery life enabling you to be out on the field for as long as needed where you’ll have all the features of this thermal imaging scope. Although this is an entry level thermal scope, it is built to withstand pressure and recoil from high caliber weapons. It has a construction of hardened aluminum alloys complemented by impact resistant electronics. ATN reports that this scope can be used on up to a 300 Win Mag cartridge. This scope is available in four different versions. All the features discussed above are similar across these models. The main differences lie in the magnification, focal length, size of the objective lens, the angle of view, and the price. ATN Thor-HD 384 9-36x: The most advanced version costs around $3500. It features a 100mm objective lens, 3 x 2.4 angle of view, and the longest focal length. Thermal sensors between the models are the biggest difference the 384 has a 384x288 thermal sensor and the 640 has a 640x480 thermal sensor allowing for more detailed images. The higher resolution thermal sensor in the 640 will give you greater detection range and sharper thermal image. AThe TN Thor-HD 384 can detect targets as far as 625 yards, recognize objects at 280 yards, and identify targets at 170 yards. 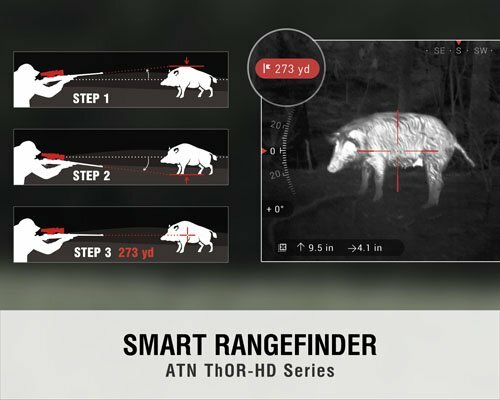 For the ATN Thor-HD 640, it can detect objects at 830 yards, recognize them at 350 yards, and you’ll identify a target as far as 225 yards. If you are looking to own a high-quality thermal scope, we recommend going with the ATN Thor-384 1.25-5x. It is the least expensive model in ATN’s line of smart infrared imaging scopes. With this model, you have a wide full of view, ideal detection range for most targeting needs, and a durable thermal scope. It has all the specs for great performance thanks to ATN’s Obsidian II Core. This scope can be used for hunting, in law enforcement, and security surveillance by security personnel. It is a small practical device with many premium features.